The 70s boho trend is back as expected with the resurgence of festival season and summertime outdoor activities. What I love about this decade of fashion is the patterns. Big, bold, beautiful, and funky designs that are way beyond your standard stripe or dot. 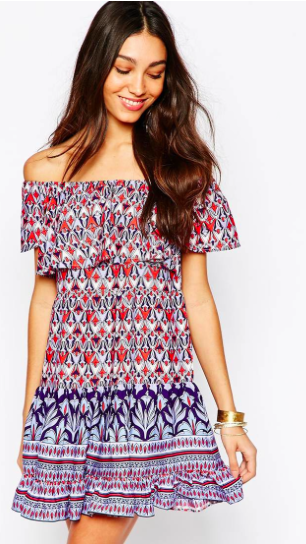 Off the shoulder is back and it looks great with this easy, breezy dress. Is this blouse pricey? Yes. But think of the versatility. This looks great with cropped olive pants, tucked into a black pencil skirt, under a suit jacket, or with cutoff shorts. It's your do it all laid back blouse. 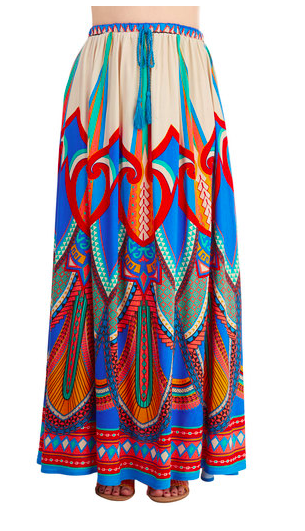 We are not short on color with this maxi skirt. I also love the tassel waist detail. Blousy sleeves, high neck, great pattern, this is boho glam. Usually I go preppy with polka dots and stripes when I think pattern. 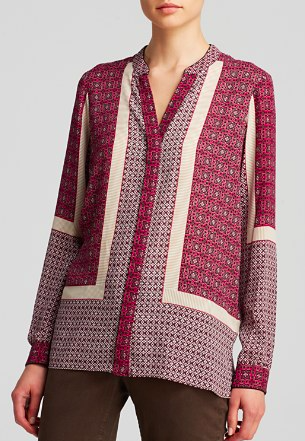 This 70s boho trend is a great way to mix up my closet with unexpected and colorful patterns.